If you are like most home owners, you don’t do windows! That’s because window cleaning is time consuming and often difficult or dangerous to do. It typically involves climbing ladders, hanging out of windows and after many hours of work, they still have streaks and smears. Window Cleaning knows that your time is important, that is why we specialize in offering homeowners like yourself the professional services of a full-time window cleaning company. Our thoroughly trained technicians are well prepared to tackle your job, however tough it may be. From interior and exterior window cleaning of old multi-paned windows and storm windows to today’s newer dual-paned windows, Window Cleaning can handle all of your window cleaning needs. Window Cleaning’s standard window cleaning service includes our exclusive 5-step cleaning process. During this initial process, our technician’s hand-scrape the exterior of your windows with specially designed scraper blades made to safely scrape debris from your glass. This helps to remove the tough stuff like baked on tree sap, acid rain, bird droppings, pollution and heavy dirt build-up from the exterior of your windows. This process might take us longer than the other guys, but we know your windows will look better and stay cleaner longer. 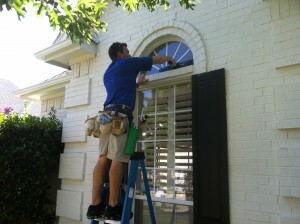 All Window Cleaning technicians are trained to provide you with the best service and experience possible. They are all fully insured, and bonded. You can use our service in confidence because all of our window cleaning is backed by our No-Streak Guarantee. I have dealt with Window Cleaning for over 3 years. Very convenient on-line service request option. Very convenient on-line service request option. Arrived within two weeks and cleaned the gutters, leaving an invoice in the mailbox.